The findings of studies investigating whether or not low serum 25-hydroxyvitamin D [25(OH)D] concentration promotes development of atherosclerosis have been contradictory. The present study employed a Mendelian randomisation approach and carotid artery intima–media thickness (cIMT), a surrogate marker of coronary artery disease, to address this question. The multicentre, longitudinal Carotid Intima–Media Thickness and IMT-Progression as Predictors of Vascular Events in a High-Risk European Population (IMPROVE) cohort study, which enrolled individuals with at least three cardiovascular risk factors and no history or symptoms of cardiovascular disease, was used for the present investigation. Participants underwent carotid ultrasound examination at baseline and at months 15 and 30. 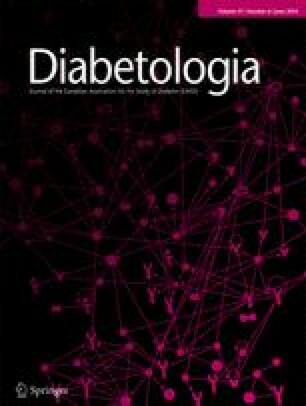 Six single nucleotide polymorphisms (SNPs) associated with serum 25(OH)D concentration in genome-wide association studies were identified and genotyped in 3,418 individuals, of whom 929 had type 2 diabetes. SNPs in the genes encoding vitamin D binding protein (GC; rs2282679 and rs7041) and 7-dehydrocholesterol reductase/NAD synthetase-1 (DHCR7; rs12785878 and rs3829251) were negatively associated with 25(OH)D levels. Effect sizes and significance of associations between SNPs and 25(OH)D levels differed between individuals with and without type 2 diabetes, although no significant interactions were observed. A SNP in DHCR7 interacted with type 2 diabetes to significantly influence progression of cIMT measures independent of 25(OH)D levels and established risk factors. Expression analysis demonstrated that this SNP modulates DHCR7 mRNA levels in aortic adventitia. SNPs in GC and DHCR7 were associated with serum levels of 25(OH)D, but only rs3829251 (DHCR7) influenced progression of subclinical atherosclerosis, as measured by cIMT, in a manner dependent on type 2 diabetes status but independent of 25(OH)D levels. Rona J. Strawbridge and Anna Deleskog contributed equally to this study. The online version of this article (doi: 10.1007/s00125-014-3215-y) contains peer-reviewed but unedited supplementary material, which is available to authorised users. The IMPROVE study was supported by the European Commission (Contract number: QLG1-CT-2002-00896), Swedish Heart-Lung Foundation, Swedish Research Council (projects 8691 and 0593), Knut and Alice Wallenberg Foundation, Foundation for Strategic Research, Stockholm County Council (project 592229), Strategic Cardiovascular and Diabetes Programmes of Karolinska Institutet and Stockholm County Council, European Union Framework Programme 7 (FP7/2007-2013) for Innovative Medicine Initiative (no. IMI/115006 [the SUMMIT consortium]), Magnus Bergwall Foundation, Academy of Finland (grant no. 110413), British Heart Foundation (RG2008/08, RG2008/014) and the Italian Ministry of Health (Ricerca Corrente). The Rotterdam genome-wide association study was funded by the Netherlands Organisation of Scientific Research (NWO) Investments (no. 175.010.2005.011, 911-03-012), Research Institute for Diseases in the Elderly (RIDE; 014-93-015), the Netherlands Genomics Initiative (NGI)/Netherlands Consortium for Healthy Ageing (NCHA) project no. 050-060-810. The Rotterdam Study is funded by the Erasmus Medical Center and Erasmus University, Rotterdam, the Netherlands Organisation for the Health Research and Development (ZonMw), RIDE, Netherlands Heart Foundation, Ministry of Education, Culture, and Science, Ministry for Health, Welfare, and Sports, European Commission (DG XII), and the Municipality of Rotterdam. Maryam Kavousi is supported by the AXA Research Fund. Abbas Dehghan is supported by NWO grant (veni, 916.12.154) and EUR Fellowship. Oscar H. Franco works in ErasmusAGE, a centre funded by Nestlé Nutrition (Nestec Ltd.), Metagenics Inc. and AXA. The authors declare that there is no duality of interest associated with this manuscript. Nestlé Nutrition (Nestec Ltd.), Metagenics Inc. and AXA had no role in the design and conduct of the study, the collection, management, analysis and interpretation of the data, or in the preparation, review or approval of the manuscript. This study was conceived by AHa, SG and C-GÖ, designed by RJS, ADel and JÖ, and analysis was performed by RJS, ADel, LF, MK and JÖ. KL and BG contributed to interpretation of the data. Data acquisition was carried out by OM, KG, ADeh, AHo, OHF, the IMPROVE study group (DB, FV, JK, RR, AJS, EM, PG, SFH, ET, UdF), the Rotterdam Study group (ADeh, AHo, OHF) PE and AHa. RJS is responsible for the integrity of the work as a whole. All authors have contributed to drafting and critically revising the manuscript and have approved the final draft for publication.